The rise and fall of convict transportation in the British Empire is often told as a Gothic melodrama. John Mitchel, the Young Ireland leader transported for treason, was typical in referring to the British transportation system as an ‘Empire of Hell’. He was even more scathing about attempts to reform the convicts in Van Diemen’s Land: ‘What a blessing to these creatures, and to mankind, both in the northern hemisphere and in the southern,’ he claimed, ‘if they had been hanged’. But were the convicts quite so fiendish – and was the system of convict transportation quite so hellish – as Mitchel claimed? Convict historians have been challenging older stereotypes for a generation or more, but they have had relatively little to say about religion. 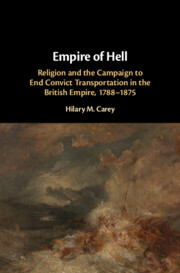 Empire of Hell sets out to illuminate the variety of reformist, religious and idealistic elements that were part of the British convict system from the late eighteenth century until the last convicts were removed from Gibraltar in 1875. Religiously-based reform lay at the heart of the convict transportation enterprise. I have been reflecting on religious aspects of convict voyaging for a long time. 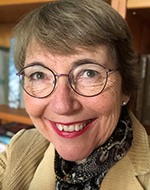 Like many Australians, my engagement with convict sites began in childhood with expeditions to Port Arthur in the former penal colony of Van Diemen’s Land, now Tasmania. I spent my honeymoon on Norfolk Island, admiring the convict graves with their poignant headstones and absorbing its disturbing history of violence. In my research, I was moved by the fiery anti-transportation rhetoric of Father John McEncroe who was a friend to many friendless men executed by the state. I was touched by the assiduous humanity of the Quaker visitors, George Washington Walker and James Backhouse, or Mrs Elizabeth Fry’s relentless agitation on behalf of women prisoners. Convict sites, many of them world-heritage listed tourist attractions, are full of ghosts – both those who came in chains and the reformers who agitated to bring the system to an end. Empire of Hell makes no attempt to celebrate middle-class religious reformers at the expense of prisoners and their suffering. Despite all attempts at reform, transportation was always humiliating and rarely reformative, even if it was not quite the living death of those condemned to slavery. What is critical to my reading of transportation is that I argue that religion was used to both justify and then to tear down the convict system. Evangelical Anglicanism was the creed of most of those who supported the first convict colonies in Australia, moderated by the enthusiasm of pietistic Methodists with their heart religion and belief in the possibility of forgiveness for all. The Evangelicals have not been received warmly by historians, but their influence was critical to the shift away from physical tortures for the condemned and toward reformation. Their most significant recruit was the remarkable Sir George Arthur, whose penal system in Van Diemen’s Land was founded on Evangelical principles from first to last. While the anti-transportation movement was led by a Nonconformist, John West, Roman Catholics were as active in condemning the ‘terror of transportation’. All creeds united to bring about its end.